Mandarin Oriental Hotel Group has today signed an agreement to manage a luxurious hotel in Istanbul, Turkey. The hotel is scheduled to open in 2016. 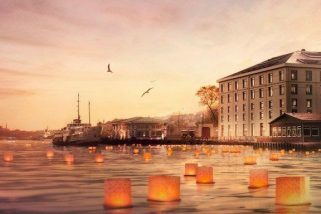 Mandarin Oriental Bosphorus, Istanbul will enjoy a prime waterfront location on the banks of the famed strait, in the area of Beşiktaş, one of the city’s oldest and most vibrant neighbourhoods. Ideally located for leisure and business travellers, the hotel will be situated close to Istanbul’s financial district as well as many of the city’s famous historical sites such as the Dolmabahçe Palace and Barbarossa’s mausoleum. The property will feature approximately 130 spacious guestrooms and suites, with expansive outdoor terraces designed to take full advantage the hotel’s panoramic vistas of the Bosphorus, the historic heart of the city and the surrounding green hills. Designed to become one of the city’s most luxurious properties, the hotel will offer guests and local clientele a wide variety of innovative restaurants and bars with al fresco waterside dining available at many of the outlets. The hotel will also offer expansive banqueting facilities, including a spacious Ballroom and further function rooms ideal for stylish social and business events. Setting a new standard for holistic wellbeing in the city, The Spa at Mandarin Oriental will offer a choice of deluxe VIP treatment suites, where guests can enjoy Mandarin Oriental’s award winning signature programmes and therapies as well as specifically developed treatments inspired by local traditions. The Spa will also feature extensive beauty treatments, a Tea Lounge and generous heat and water areas. An indoor swimming pool, large fitness centre with top of the range equipment, as well as a meditation room, will further enhance the hotel’s leisure facilities. The owner and developer of the project is Astaş Real Estate Investments and Tourism A.Ş, which is also developing Mandarin Oriental, Bodrum, Turkey, currently scheduled to open in 2014. “We are delighted to be working with Mandarin Oriental on creating what is set to be the most sophisticated hotel in Istanbul. Mandarin Oriental’s position as one of the world’s leading hotel operators, as well as the Group’s reputation for excellence, matches our vision for this truly stunning site on the banks of the Bosphorus, with its unique location between both Asia and Europe” said Vedat Aşci, Chairman of Astaş Real Estate Investments and Tourism A.Ş. Straddled between Europe and Asia and steeped in history, Istanbul is considered one of the world’s most exciting destinations. Celebrated as a crossroad between East and West for centuries, the city, which was once known as Constantinople, served as the capital of the Byzantine and then the Ottoman Empire. Istanbul is Turkey’s financial and commercial centre and the city’s colourful history and culture, combined with its stunning setting on the Bosphorus, makes it a unique destination for international travellers.